Neutropenic patients may not have usual signs of infection. Redness, tenderness and fever may be the only signs. Critical examination of areas usually harboring infections, including but not limited to, oral cavity, axillary region, scalp, groin, perineal region. Patient afebrile – continue the empirical antibiotic till antibiotic sensitivity is available. When to add empirical colistin in febrile neutropenic patients? 2. Colonisation with carbapenem resistant gram-negative bacteria. 3. Previous infection with carbapenem resistant gram-negative bacteria. 4. GNB in blood, sensivity pending, persistent fever with haemodynamic instability. 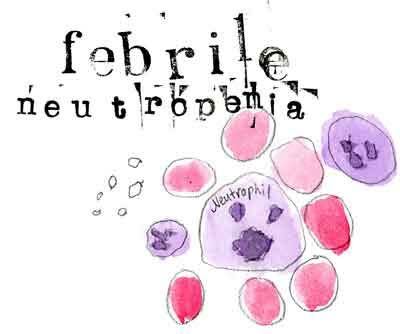 When a patient is located at a remote area and may not have access to emergency healthcare services, febrile neutropenia can be lifethreatening. Under such circumstances, availability of broad-spectrum oral antibiotics with the patient can help them gain time to reach emergency healthcare service. Febrile after 72 hrs-CT chest and consider empirical antifungal. Antibiotic treatment should be given for at least seven days with an apparently effective antibiotic, with at least four days without fever. Once Neutrophil count has recovered, with no culture positivity and heamodynamically stable; antibiotics can be stopped and patient observed, even if remains febrile. Evaluate for fungal infection, if at risk. Though quinolone prophylaxis is recommended by International guidleines, it is not useful in Indian scenario due to high resistance. All patients being treated for cancer need to receive annual influenza vaccination with an inactivated vaccine. Neutropenic patients presenting with influenza like illness should receive empirical treatment with neuraminidase inhibitor.